Tactus Therapy Solutions apps cater mostly to adult clients, however, each of their apps has a child-friendly mode. I am thankful for this mode because it allows me to use the application with appropriate images for my students. Category TherAppy is no exception, which is great because I have many students who are working on categorization and vocabulary skills! This application is clean, free of distractors, and uses real-life images. 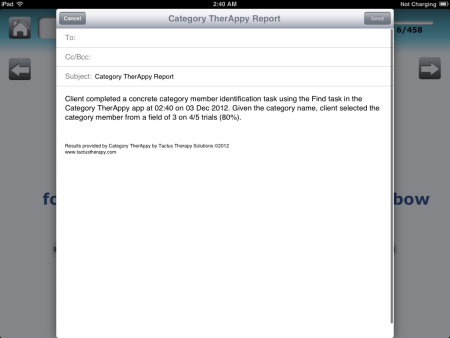 Continue reading for more information on using Category TherAppy in a school setting! The "Main Page" of this application has four different options for application play, a settings button, three different level options, a connect button for social media, an other apps button, and an info button. Pressing this button will bring you to Tactus Therapy Solutions' app store on iTunes to view other applications developed by them. Pressing the "Connect" button brings up a menu to follow Tactus Therapy Solutions on various social media, receive their newsletter via e-mail, or review the app on the App Store. Pressing the "i" button will bring you to the information page to learn how to use the application, the populations it is intended for, view Tactus Therapy Solutions' web page, send feedback/ask questions via the company's e-mail, view the credits, and follow the company on social media. Maximum Number of Trials - You can choose the number of trials to have the client practice by pressing the 10, 25, 50, or All button. 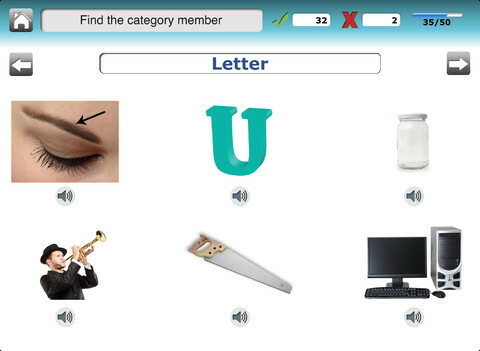 Target Type - You can choose to have words and pictures, pictures only or words only shown on the stimulus items. Field Size - Choose between a Small (2-3 items), Medium (3-4 items), or Large (4-6 items) field of items to display. E-mail Address to Send Results - If you would like to e-mail yourself the results from a session, type your e-mail address in the white rectangular box. Child-Friendly Mode - Use the on/off switch to turn on or off child-friendly mode. When Child-Friendly Mode is on, references to alcohol/violence will be removed and children will not be able to visit the outside links on the Main Page. Audio Reinforcement of Category - You can use the on/off switch to turn on or off audio narration of the category for the Exclude and Add One activities. Easy (Concrete Categories) - Basic categories, such as animals, furniture, and food, will be used in activities. Medium (Sub-Categories) - Sub-categories, such as accessories, birds, and vegetables, will be used in activities. Hard (Abstract Categories) - Abstract categories, such as liquids, things made of wood, and things that fly, will be used in activities. 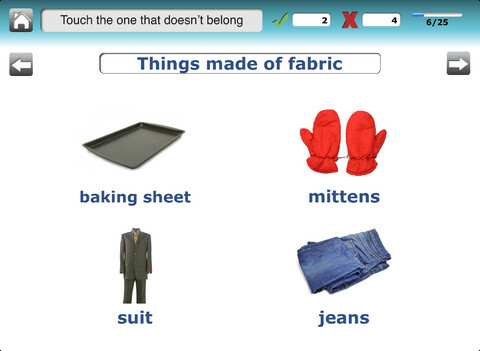 Find - Press the item that belongs in the category presented. If correct, a green box will appear around the item with a bell sound. If incorrect, a red box will appear around the item, a different sound will play, and the item will be faded. Classify - Press the category in which the item belongs to. If correct, a green box will appear around the item with a bell sound and the item will move to the category box. If incorrect, a red box will appear around the item, a different sound will play, and the item will be faded. Exclude - Press the item that does not belong in the given category. The category is not shown at first, but if the user presses "Hint", the category will be shown and the trial will be recorded as incorrect. If correct, a green box will appear around the item with a bell sound. If incorrect, a red box will appear around the item, a different sound will play, and the item will be faded. Add One - Press the item that belongs in the given category. 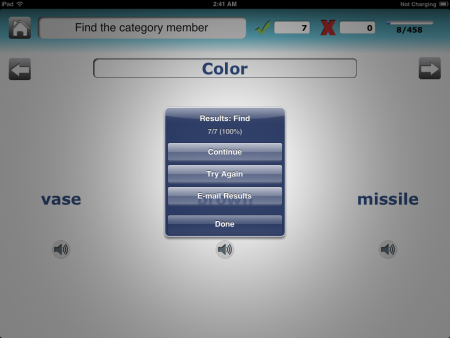 The category is not shown at first, but if the user presses the "Hint" button, the category will be shown and the trial will be recorded as incorrect. If correct, the item will join the group in place of the question mark box. If incorrect, a red box will appear around the item, a different sound will play, and the item will be faded. 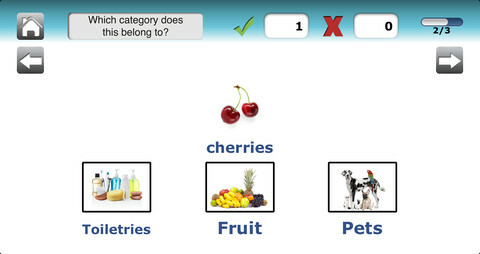 After choosing the level of difficulty and activity, a category/multiple categories must be chosen. The categories presented depend on the level chosen. You can select or deselect all by pressing the button at the bottom of the "Choose Your Categories" page. Otherwise, press the checkmark(s) next to the category/categories of your choosing. Next, press the right arrow key to begin practice. Instructions for the task will appear in the top left hand corner of the page. The number of correct trials will show next to the green check mark and the number of incorrect trials will appear next to the red "x". In the top right hand corner, the trial number and total number of trials will show with a blue progress bar. Navigate through the trials by pressing the arrow keys. Once a correct answer has been chosen, it cannot be played again, but answers that have not been selected or are incorrect can be gone back to and reviewed. When an answer is chosen correctly, the application will auto-advance to the next trial. If the user needs the instructions, category name, or items auditorily stated aloud, he or she can press on the text or microphone button. When the trials have been completed or the "Home" button has been pressed, a pop-up box will appear. It will state the results of the trials at the top followed by the choice buttons to continue application play, to try again which starts over the trials, to e-mail results, or to be done with application play. If you chose to e-mail the results of the trials, an e-mail window will appear with the results of the task including the time and date of the session, type of activity, field of items, and accuracy in a fraction as well as percentage in paragraph form. Make sure you have your e-mail account connected to the Mail application on the iPad and have a WiFi connection to send the e-mail. The application is clean and simple to use for clients of all ages. There are real-life photos, a white background, and no distracting backgrounds or audio. I definitely like the settings for the application so that one can use it with multiple clients and also change the settings as a client improves. It is great that you can choose to have words and pictures, pictures only, or words only used depending on the clients' needs. There are three different levels of categories - concrete, sub-categories, and abstract - which allows for use with multiple clients or can be adjusted as a client improves in categorization skills. The ability to e-mail results makes therapy so much easier because you can focus your time on explaining why different choices were correct or incorrect and actually teach rather than have to teach and write down results. What I absolutely love is that the client is able to press the text or a microphone button if he or she needs to hear an item, category, or instruction stated aloud. Each time Tactus Therapy Solutions comes out with a new application, I like the settings more and more! However, as I always say, I love having the ability to store and track data for clients within an application. It would be great if the therapist could chose specific items within a category or subcategory to practice with a user if needed. Articulation/Fluency/Voice - Have children state each item aloud or just the correct item in a trial before moving on to the next trial using their best speech sounds, fluency strategies, or vocal strategies. Categorization - This application is all about categorizing objects through inclusion, exclusion, category identification, and an identifying an item in a given category. You can have students state the correct answer aloud prior to pressing the correct answer or teach concepts by navigating through trials. In addition, you can discuss the difference between concrete, sub, and abstract categories. Vocabulary - Work on a students' ability to name or identify vocabulary in a given category. Have them describe items by what they look like, their function, etc. Expressive Language - Have students put one item or all of the items into a sentence or describe their connection aloud. Social Communication - Have children discuss their favorite foods, clothing, etc. within a category. 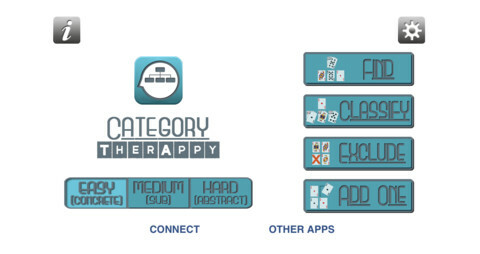 Category TherAppy is available for the iPod Touch, iPhone, and iPad for $14.99. You can try the Lite version of Category TherAppy for free.